Ongoing scientific research suggests that around 30 per cent of the wealthiest individuals buried around the neolithic and Bronze Age temple came from hundreds and, in some cases, thousands of miles away. Recent isotopic tests carried out by the British Geological Survey and announced yesterday reveal that one very high-status individual – a teenage boy – found buried near Stonehenge, had in fact come from somewhere along the north coast of the Mediterranean, potentially Spain, southern France or Italy. Another individual, whose origins were revealed a few years ago, came from the Alps – and others came from Brittany (or possibly Wales). The Alpine individual suffered from a painful leg condition and the Mediterranean teenager died aged 14 or 15 and is likely therefore to have also suffered from serious illness. Some archaeologists have therefore begun to speculate that Stonehenge attracted health tourists who went there to be cured – and ended up being buried there instead. 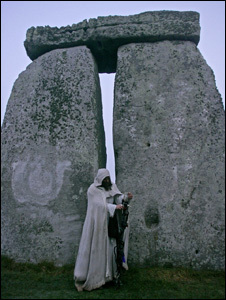 Interestingly, a healing function for Stonehenge is hinted at by Arthurian legend, which holds that the monument was indeed an ancient healing centre. Even as late as the 18th century, the stones of Stonehenge were regarded as having magical healing powers – and visitors to the site often chipped bits off to take away as talismans. Certainly the monument was internationally known in ancient times – and appears to have been described by a fourth-century BC Greek geographer, centuries after it had actually gone out of use. Stonehenge’s international visitors were extremely wealthy. The Alpine man was buried with gold and copper objects – including three copper daggers and a pair of gold hair clasps. The Mediterranean teenager was buried wearing a necklace of around 90 amber beads. “Isotopic analyses of tooth enamel from both these people shows that the two individuals provide a contrast in origin, which highlights the diversity of people who came to Stonehenge from across Europe,” said Professor Jane Evans, head of archaeological science at the British Geological Survey.